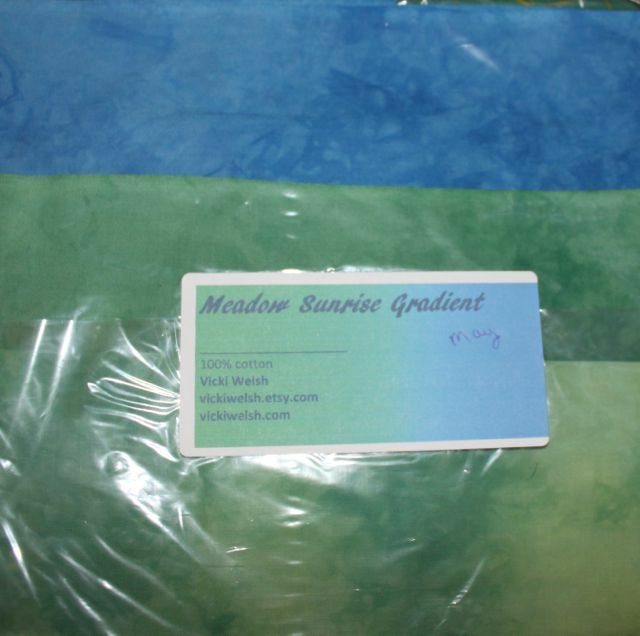 As the end of May draws near, it is time to put away your green scraps and pull out the blue. Don't worry if you haven't use up quite all your green yet, Our inspiration Palette for June has blues tending toward aqua along with a pop of lime green as an accent. The Sampler block will be a split pinwheel, stay tuned for more details. 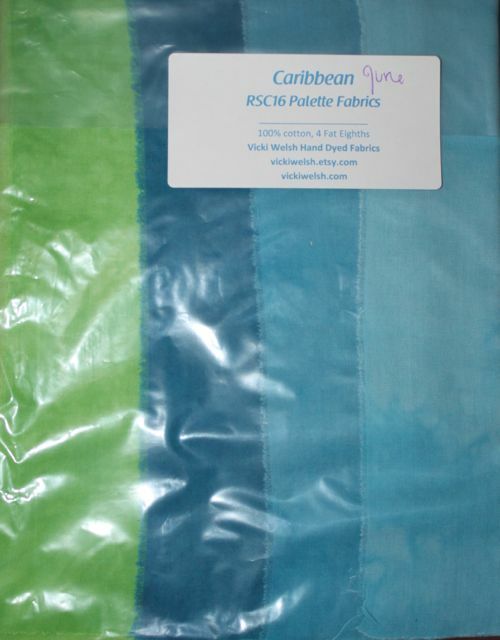 Be sure to check back on Saturday for our June fabric giveaway. 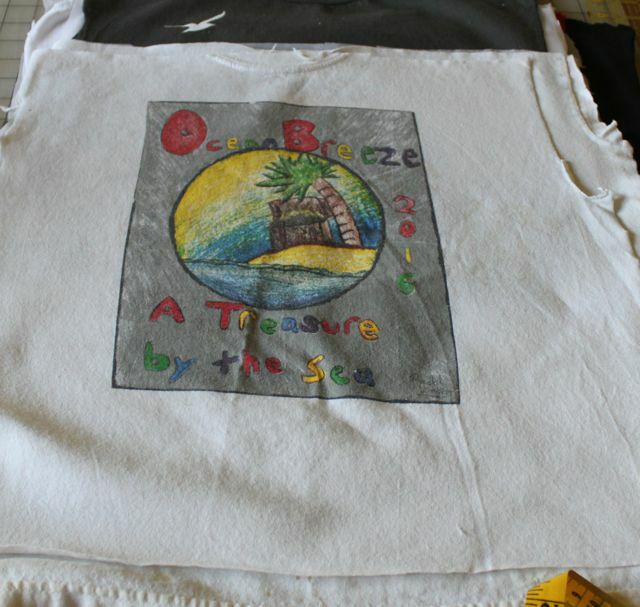 ScrapHappy Saturday -- Ready for Summer!!!! Today feels to me like the first day of summer vacation. Technically, school ended Tuesday and Wednesday was post planning, but then I was presenting at a conference on Thursday and Friday I started moving classrooms. Today there is nothing though, but me and my sewing machine. I had so much fun with these string blocks, that I think I will start there. What are you up to today? Misterlinky is below, please share with us all. There is something strangely satisfying about taking a humble pile of strings, trimmed from the ragged ends and edges, and turning them into a bright and beautiful stack of blocks. The greens are ready to be trimmed to size and joined together to make three more diamond crumbs. It was a relaxing way to spend a morning in between the normal weekend chores. Kurt has gone down south with the girls for a two day LAX tournament, and Ryan has a friend over to "hang out". With just two days of school left, I think there might be a few more blocks lurking in the string bin. 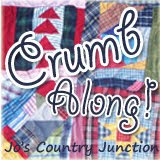 First though, I'll hop over to Quilting is More Fun than Housework to see what is happening at Oh Scrap! Just two more Saturdays to play with green! I'm in the mood for a bit of mindless messiness today to contrast with the daily cleaning and organizing which is wrapping up my school year. I think these green strings will be the perfect choice. Hopefully there will be plenty of time for sewing this summer. Just two more days of school to finish off, then one day of post planning and a technology workshop. After that it will take me a few days to swap rooms and then summer can begin for real. May is almost halfway done and all I have to show on the sewing front is this one flying goose block. It took about 10 minutes to make. 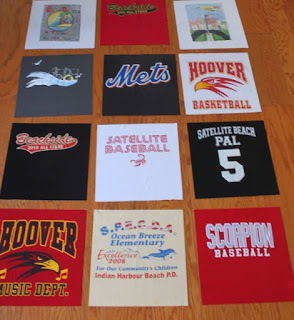 I did almost finish a t-shirt quilt that needs to be ready before graduation. It just needs binding. Life is crazy and happy around here. Every week I keep thinking that surely things will calm down, maybe next week will be that week? My AP kids happily took their exam on Monday. I always make breakfast to send them off happy. Not only did they leave happy, but most of them came back out happy which is always a good thing. They always want to talk about the test right away, which isn't allowed of course. They released the free response questions on Wednesday, but by then they didn't want to talk about the test anymore. Then on Thursday and Friday, my freshman went in for their End of Course exam. They were done super fast and ready to go back to class by the time I was supposed to see them. They wanted to talk about the test too, which also isn't allowed. We watched The Bee movie for decompression and they all enjoyed that. 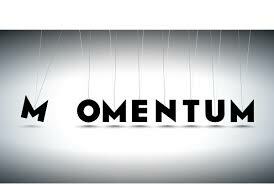 Monday we will start working on our final projects of the year and then exams start on Thursday. I really do think that it looks like a fairly calm weekend. I need to go out and check on our camera traps and Ryan has a play practice. No out of town LAX, no weekend study sessions, no out of town trips. I wonder what I will do with myself? Oh, wait, I do know what I will do myself. You can be sure that fabric will be involved! There are so many ways to make a flying goose block. I will show you my favorite, but then give you links to other methods in case you want to try something different. 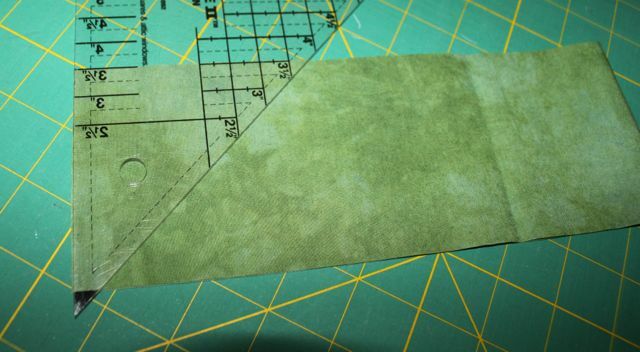 I like using specialty rulers because it allows both parts of the block to come from the same size strips of fabric. to get 3.5 by 6.5 inch unfinished blocks, we will use 3.5 inch strips. The easy angle ruler is the same one usually used to make HST units. It is used for the sky behind the goose. 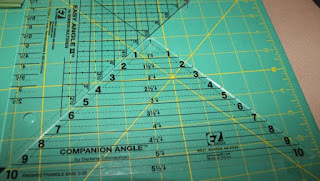 The companion angle ruler is also used for quarter square triangles. It is used for the goose part of the block. Start by folding your strips in half to get two pieces with each cut. If you are planning to vary the placement of light and dark fabrics in the block, you can square off the end of a fabric strip and then get a pair of background triangles from the end of the strip used to cut wing triangles. 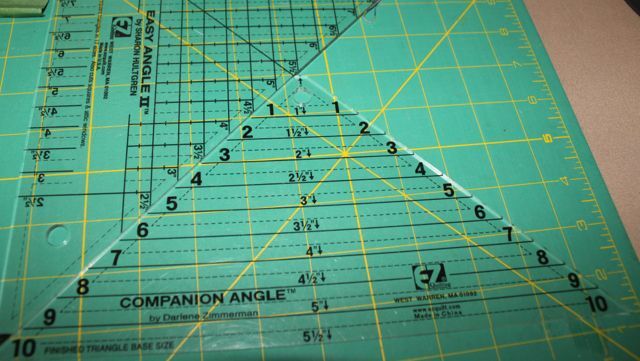 Now that you are ready to start cutting goose triangles, you will need to switch to the companion angle ruler. 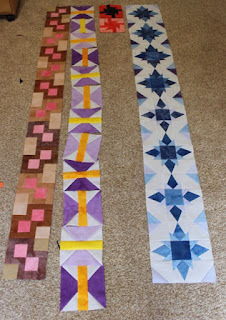 Notice that the center numbers show that you should use 3.5 inch strips and the numbers on the edges indicate that the block will finish at 6 inches. Now go back the easy angle ruler and cut pairs of background triangles. These are your wing or sky pieces. Each block will need one goose and two wings. Sew one wing to the right and finger press before sewing the other wing to the left. Remove both dog ears and press. 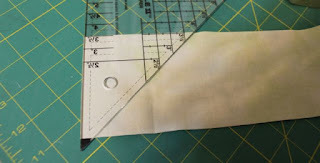 Make sure that you have a quarter inch seam allowance left at the top of the block. It is really easy to loose this with an uneven seam allowance. You will need 24 blocks for the large quilt and 18 for the small quilt. Here is a link to perhaps the easiest method of making flying geese, the flip and sew. It does waste fabric, but you can put the extra fabric to good use making bonus triangles if you like. 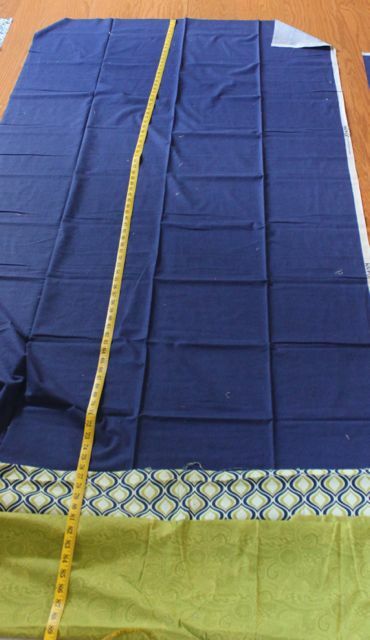 For fabric pieces of this size, it would be well worth the extra work. 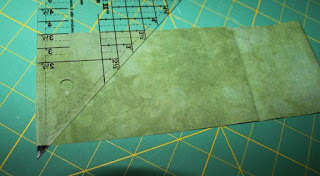 you should cut one rectangle 6.5 inches and two 3.5 inch squares for each block. Here is a link to a no waste method that makes four blocks at a time. You will need to cut your sky squares to 3 and 7/8 and your goose squares to 7 1/4. There is a cutting chart here which lists many sizes of blocks. Fons and Porter has a handy PDF of the same instructions for the same method. Handy PDFs are always nice to save for later. They also have a specialty ruler which allows you to cut both parts of the block from the same ruler. Here is a link to another specialty ruler from quilt in a day. Specialty rulers really can be useful for blocks that you make a lot. 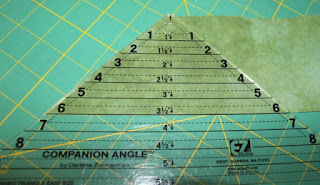 Craftsy has a nice article with non-specialty rulers for comparison purposes. Do you prefer a different method? Leave a comment and I will try to add a link to this post. Today begins the green month. In celebration, I am giving away this bundle of hand dyed fabric from Vicki Welsh. In celebration of the imminent start of summer vacation you may enter the drawing by leaving a comment on this post with your favorite summer activity. Vicki has a new website, so be sure to go and visit. Mister linky is below. 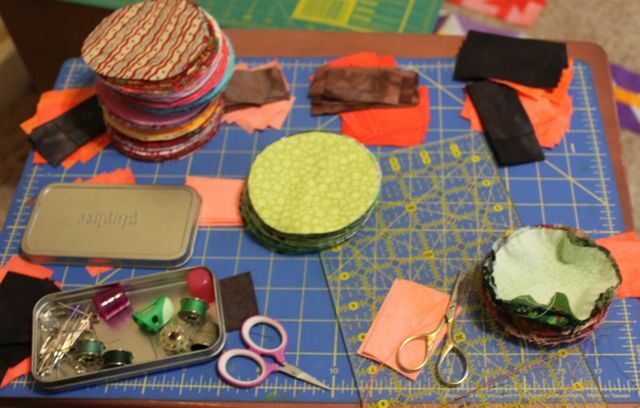 I know the green month is just starting, but be sure to share you projects and plans. 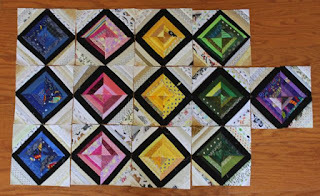 Our sampler block this month will be a 3 by 6 flying goose. I'll work on the tutorial for that soon. 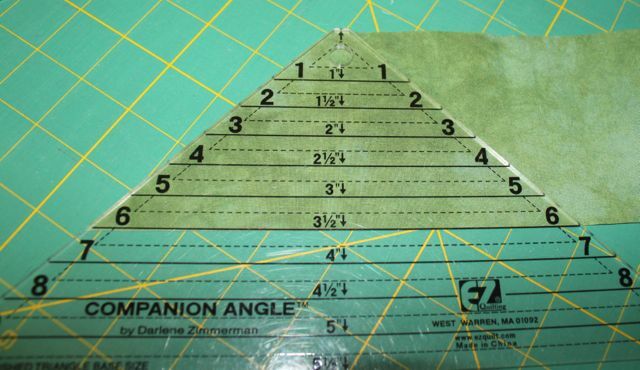 I will be using my companion angle ruler, but I'll be sure to include links to all some of the different ways there are to make flying geese. The girls picked fabric for curtains when we painted their bathroom. That was a while ago. They are having birthday parties this month and wanted to get everything finished up. 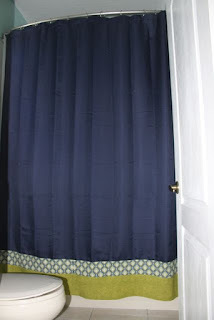 So there are two new curtains for the windows. 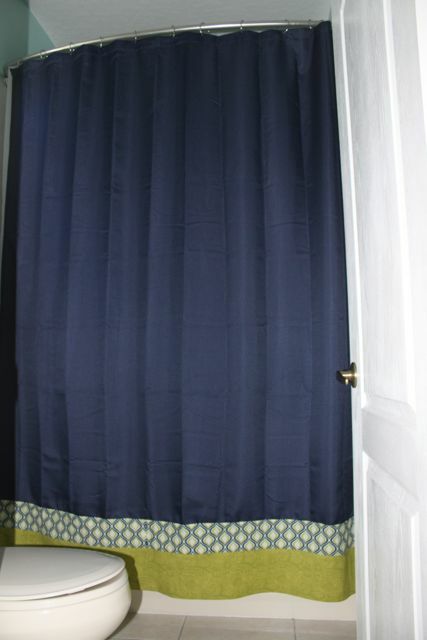 And one new shower curtain. That wasn't what I had planned for today, but it is nice to cross it off the list -- finally. I have been out of town or scheduled solid for the last three weekends! Crazy! I need weekends to unwind and relax. To sew! Without that break from the busy school week, I tend to go a little bonkers. That's where I am now, between bonkers and frazzled. This was finally a weekend without any trips out of town or huge events to plan. So first on the list was starting to get caught up on the column along. 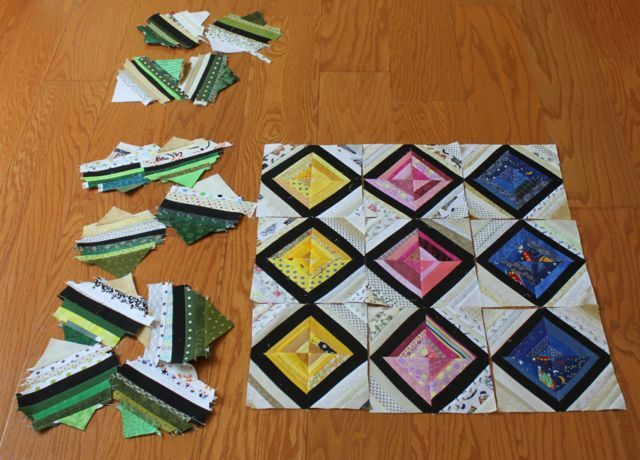 The butterflies are done, but not sewn together yet, and most of the orange blocks are partially assembled. Now on the the flying geese for May! I still need to finish up the PDF files, but at least the links on the Sampler tab are up to date. Anna wants me to finish this shower curtain first though. I was supposed to make it when I painted the girls bathroom. I think that was two summers ago? Bad Mom! I will need more of the blue though, I remember using up most of it to finish off Hawaii Sunset. So worth it though. It only took half an hour to trim out the blocks for the t-shirt quilt. The lattice fabric just came out of the dryer, so cutting that out shouldn't take too long. We are all in the midst of mad cleaning now. Kurt has invited all of his new work people over for a party on Thursday. At least it is Thursday though, so I will still have a weekend to play when it is done. 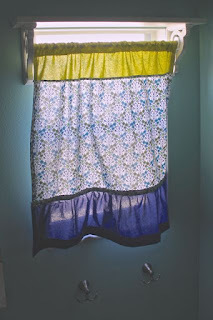 I am linking up with Quilting is More Fun than Housework for Oh Scrap. 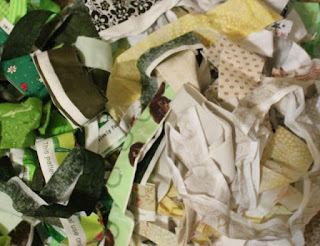 Head over to check out more scraphappiness. May is here! It is time for a deep breath and a fresh start. 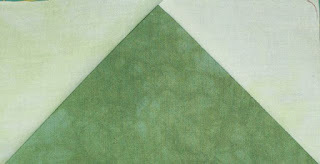 The new color inspiration is an evergreen forest. Think of a soft loden green tree with a dusty brown trunk. 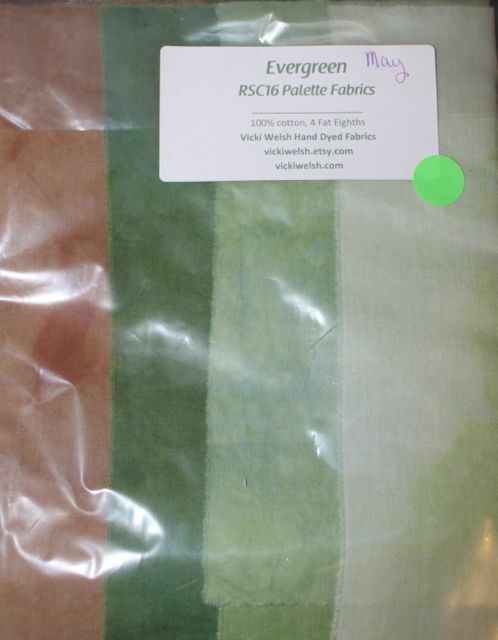 Vicki Welsh designed this group of hand dyed fabrics to inspire us all this month. Check back on Saturday for a giveaway of a different bundle of her fabric. While working on the last of my orange blocks yesterday, I got sidetracked with my circles. All the orange blocks were finished up on my trip last week to Disney. Having a stack of precut circles ready to stitch during down moments was a nice way to be productive while waiting for the next round of competition. Now I've got a good start on the preparation of the green blocks, so May is off to a good start. Before I get too carried away with my own projects though, I have promised to have at least part of a t-shirt ready for graduation. 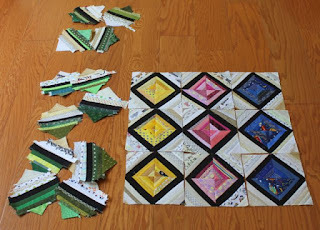 Through a process of negotiation, we agreed that I would sew the blocks together if she did the prep work. So earlier this week, she brought a stack of rough cut, stabilized shirts, ready to trim and sew. 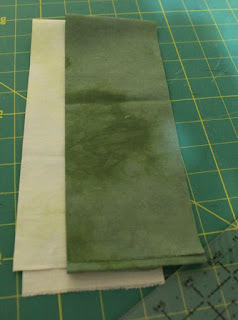 She even included the fabric for sashing and backing, so the time will be much less than starting from scratch.